Keeps my bun slick and smooth all day! I use this gel to keep my low bun slick and smooth (for work) from 6 am until 5 and it does the job! It smells amazing as all Tresemme products do, and a little bit goes along way. I use about a dime size and just smooth it all over my hair after I have it wrapped in a bun. Than I use Tresemme hairspray to keep it in place. 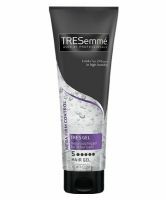 I have also used this gel after I shampooed my hair and use a diffuser...read more to give it soft curls with little heat. All Tresemme products are great and always do what they claim; excellent line of drugstore products! I love this! It is excellent at keeping my looong hair straight after I use the straightening iron. Nothing compares. It also doesn't weigh my fine hair down like some other products do.